Project Veritas has once again exposed the lies of the leftwing. Twitter, Facebook, and other social media are censoring conservative posts to keep their vacuous followers ignorant. They use what they call a “Shadow Ban” in which they allow the post to be made but they do not disseminate it or allow a Google Search to be made for it so no one ever sees it. They claim they are “protecting people from ‘hate speech,’” but the truth is that they don’t want the truth to be put in front of the faces of oblivious liberals where they might learn how they have been duped by Democrats. What they want to keep people most ignorant of is that Obama and Hillary pulled off the greatest crime since the Founding by using America’s Intelligence agencies to spy on the Trump Campaign. DACA is a leftist program designed to bring the most ignorant, dependent people in the world into America to be added to the dwindling Democrat base. Despite what President Trump said in the open meeting about immigration reform he will not sign anything that Democrats and RINOs put in front of him. He will stand by his campaign promises regardless of all else and take the heat for it. But what he did was expose what Republicans are more willing to work with Democrat elitists rather than for the people. Without voter fraud, having dead people and illegals and felons vote, Democrats wouldn’t have nearly the power they have today. Democrats have been mostly in control of government for the last century after Woodrow Wilson taught them how to use propaganda to cover up how their high taxes are impoverishing Americans by blaming Republicans. Ignorant people, who don’t know how business works, are taught that high taxes are to their benefit and they must rely on government to steal from the rich for them. Of course, it is only one set of elites stealing from the others. These people who claim to be for free speech, just as they claim to be for liberty and prosperity, prove once again that the only thing they are for is lying to dupe the ignorant so they can part fools from their money. Net Neutrality was the Democrat’s effort to censor the Internet under the guise of “fairness,” but the proof of that lie is in the Internet not being censored by Republicans, but by Democrats. It is part of their campaign to keep their base ignorant believing lies like college in America should be free because K-12 is free. These uninformed young liberals don’t know that their parents paid for their education through their taxes. They believe teachers work for the government for free as slaves, that schools are built for free by slaves, and they don’t understand that what they believe in is the slavery for which Democrats have always advocated since the Founding. They are kept ignorant because they are uneducated and understand nothing of the Founding and the difference between Republicans and Democrats and who they have always been. Democrats were originally Federalists who wanted the President to be a King. Does that give you a clue of their true nature? An educated populace does not embrace the epic failure of the elitist rule that is socialism. Watergate was amateur hour for Nixon trying to spy on the Democrat campaign in ’72. As Rush Limbaugh states, the so-called “Trump Dossier” FISA Warrant to spy on the Trump campaign is ten times Watergate, a hundred times Iran-Contra. Hillary created a phony intelligence story that Obama used to obtain a FISA Warrant to spy on Trump, and it is now used as the basis for their fraudulent claim that Trump had Russia hack the election. But their web of deceit is coming unraveled as more and more of the truth comes out. The only question is will President Trump allow the investigation of this fraud to go forward and take down the anti-Americans who are trying to destroy this country? Democrats have always been against American liberty and have been using propaganda and illegal immigration to unmake America in order to transform it into their own socialist banana republic toilet. 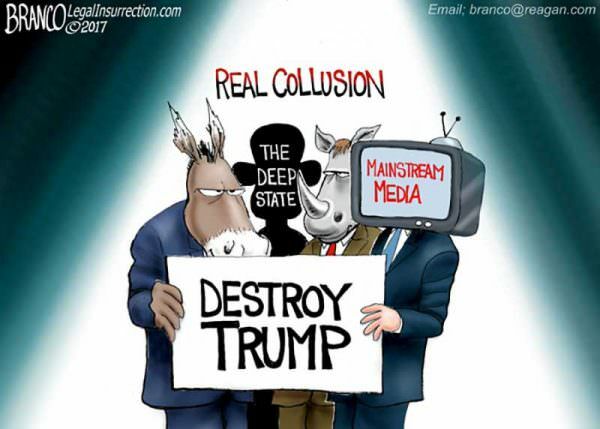 This entry was posted in Politics and tagged Deep State, Democrats, Donald Trump, Facebook censorship, Federalists, Hillary Fraud, Obama Hillary Media Collusion, Project Veritas, Shadow Ban, Socialism, Trump Collusion, Trump Dossier Fraud, Trump FISA Warrant spying, Twitter, Twitter Shadow Ban. Bookmark the permalink.